Explore the colours of the season in Fergus & Elora. You don’t have to travel hours north for spectacular autumn views. We have them too! Visit Elora and Fergus. Autumn leaves. Elora Gorge. Grand River. Belwood Lake. Elora Cataract Trail. Shops. Great restaurants and pubs. Scenic views. Maybe you’ve seen it all before, but have you seen it in October? It’s awesome. The fall colours are ever-changing, accenting our spectacular natural vistas with bright colours of reds, oranges and yellows as the Grand River ripples throughout the heart of Elora and Fergus, flowing out of Belwood Lake and the Shand Dam, making for picturesque views as it winds through the high limestone cliffs and forested edge of the Elora Gorge. Whether you want to immerse yourself in nature and capture it all with your lens, or you’d prefer to take it all in from a pub or a café, or you just want to spend a day with friends shopping and touring two of the prettiest towns in southern Ontario – you’ll love the view here. “OMG everything? Every walk is absolutely gorgeous with autumn leaves. The Elora Farmers’ Markets are also full of amazing food.” – Kate G.
“Biking on the trails, just like in every season, but in fall, it’s particularly beautiful to tour these trails.” – Brian C.
“Monster Month! 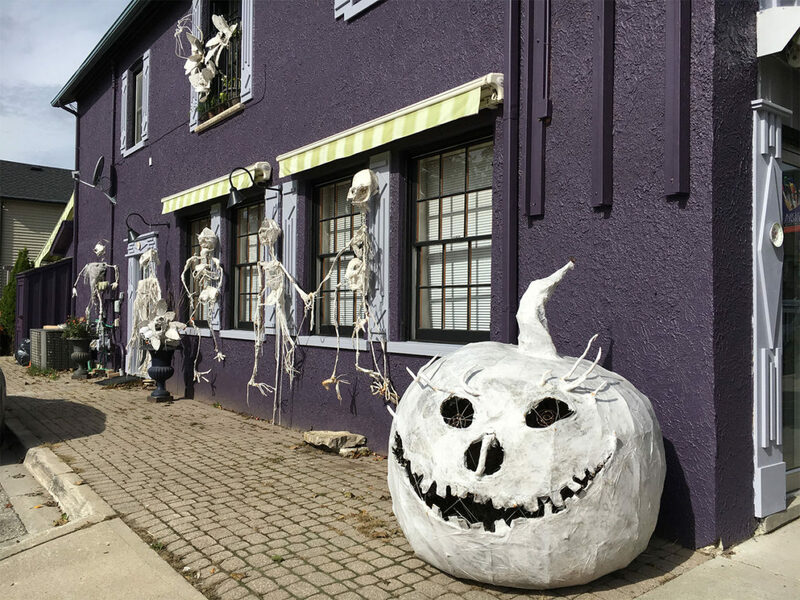 Keeping Halloween real in Elora. And fall is beautiful here. We love taking walks along the Gorge, through the trees.” – Chris M.
Bring your bike, or grab your hiking boots, or hey, walk the dog along the Elora Cataract Trail. You can journey from the shores of Belwood Lake and the heights of the Shand Dam all the way Fergus, Elora and beyond. Clear, clean and peaceful trails surrounded by nature. Through forests, farms and two beautiful towns, you’ll get away but still be near. 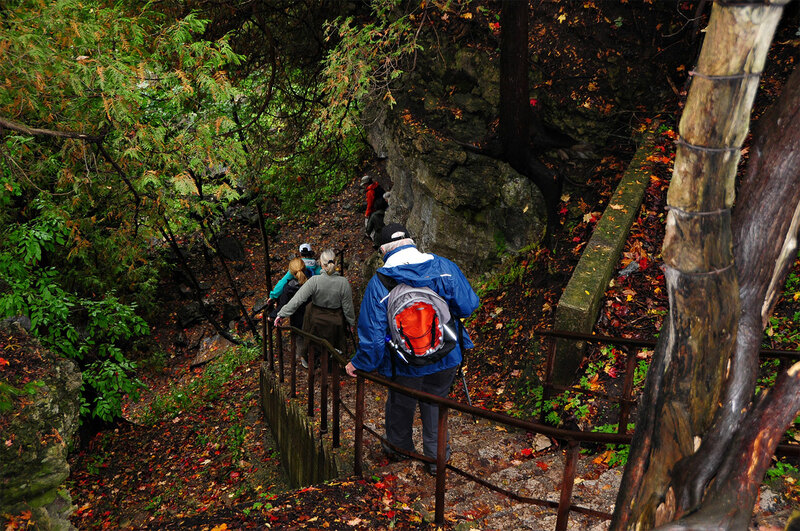 Explore the Elora Gorge without even leaving the village of Elora. Just follow the signs for the best views. And don’t be shy! Ask a local. They know the best spots. Check out the view of the Grand River in downtown Fergus. The walking Milligan Footbridge offers a beautiful view in either direction. Watch out for Monsters! Don’t worry, they won’t bite. Look around Elora for these freaky, spooky hand-crafted monsters by renowned Elora artist Tim Murton, part of his Twilight Zoo creations and the inspiration for Monster Month, celebrated each October with great enthusiasm in Elora. We choose to put the fun into Halloween, rather than the fear. Bring the kids and find your spirit too! Shop our two historic downtowns for unique treasures with friendly service, not because we have to be nice, but because we just genuinely are friendly folk. Pubs, restaurants, drinking establishments (because it sounds way classier than ‘bars’ and we are quite classy here) and let’s not forget Elora’s own brewery. Cheers to you, autumn! Find your way to the Trestle Bridge, part of the Aboyne Trail adjacent to the Wellington County Museum and Archives for an incredible view of the Grand River and the colours of the season. Tucked in between Elora and Fergus, the views in every direction make this is a destination spot. Make your Saturday morning complete with a trip to the Elora Farmers’ Market to enjoy seasonal bounty of harvest season. Come enjoy the sweater weather with us! And be sure to share your adventures with us on Instagram @visitelorafergus @bythegrand #visitelorafergus #bythegrand.